Cake doughnuts are baked (not fried) with maple syrup and squares of crisp fried bacon, then topped with a maple syrup glaze. The result? A tender doughnut that tastes like pancakes with maple syrup and bacon — in portable form. 15 mins. to 15 mins. Preheat the oven to 350°F. Grease the wells of two standard doughnut pans. If you don't have two pans, no problem; you can bake in two shifts. Don't have a doughnut pan? See "tips," below. In a medium-sized mixing bowl, beat together the butter, vegetable oil, and sugars till smooth. Stir in the baking powder, baking soda, salt, and vanilla or maple flavor. Distribute the bacon pieces evenly among the wells. Drizzle the maple syrup over the bacon, using about 3/4 to 1 teaspoon per doughnut. Spoon the batter evenly into the pan(s), filling the wells up to the rim. Bake the doughnuts for 15 minutes, or until they're raised and firm, and a toothpick inserted into the middle of one comes out clean. Remove them from the oven, and place on a rack or trivet. Loosen the edges of the doughnuts with a table knife or spatula, and immediately turn the pan(s) over onto a piece of parchment or waxed paper. Rap the edges of the pan gently to loosen the doughnuts, and lift it off. 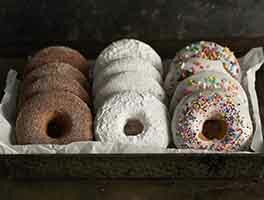 Place the doughnuts on a rack to cool slightly while you make the glaze. 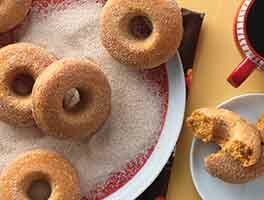 To make the glaze: Stir together the confectioners' sugar, salt, and enough maple syrup to make a spreadable glaze. Spread the glaze over the doughnuts. Serve warm, or at room temperature. Wrap any leftovers loosely in plastic, and store for 1 day at room temperature; refrigerate or freeze for longer storage. For more bacon flavor, substitute bacon fat for all or part of the butter, if desired. 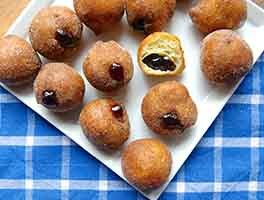 If you don't have doughnut pans, scoop the batter into the lightly greased or paper-lined wells of a standard muffin pan. Top with the bacon, and drizzle with syrup. Bake in a preheated 425°F oven for about 15 minutes, or until a toothpick inserted into the middle of one of the center muffins comes out clean. Remove from the oven, and transfer the muffins to a rack to cool. When they're nearly cool, spread with the glaze. If you're not planning to serve the doughnuts right away, don't glaze them. Wrap and freeze for up to 3 weeks. Thaw overnight in the refrigerator, then reheat in a preheated 350°F oven until warm. Stir together the glaze, and glaze doughnuts before serving. The recipe is very forgiving. I waken at 4 am to bake for work, made only few mixing errors. I didn't thin the topping sufficient to make spreading easy, but still turned out quite well. My co-workers had no trouble eating all 12. 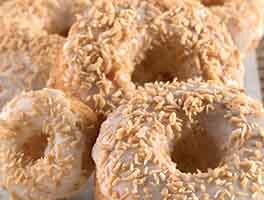 I plan to try several other donut recipes. BTW, I'm learning to weigh rather than measure as I learned growing up. I followed this recipe exactly. But I found that by adding the flour and milk in stages and mixing for so long, I ended up with a chewy product. Also, the bacon stayed in the pan and not on the donut. Next time, I'll mix the bacon in with the batter, and then add some to the top of the frosting. I used this as my BASE recipe, making half for 6 donuts. Here's what I did: omitted the bacon topping added Buttery Sweet Dough Bakery Emulsion used K/A Dry Buttermilk Powder Added Cream Cheese Icing Flavor to the glaze, making a LOT of glaze so I could completely dunk/drench the donuts in it. Oh.My.Goodness. These were WONDERFUL!! So good! The glaze was thick so definitely glaze the donuts when they are warm. I was able to get 18 doughnuts with this using a doughnut pan. I followed this recipe to the "t." I so wanted to like it but I just can't. Hardly any bacon or maple flavor but a lot of flour taste. I'm going to try this recipe again, making modifications I believe will give less of a flour taste and more bacon and maple flavor. These were really good. Made into muffins the first time and they burned on the bottoms because, I think, the temperature is too high (regular size muffin pan made about 16). Made the second time in donut pans and they came out good. Next time I think I'll either stir the bacon into the batter or just sprinkle on the maple glaze. Very easy to make. I doubled the recipe, and it turned out fine and gave me 22 donuts. I didn't want to deal with having bacon just sitting on top (the topping), so I mixed it into the batter, and it was great. I don't care for the glaze, it just tastes like powdered sugar. They are excellent without the glaze, but the donuts taste like pancakes, so they were great dipped in just syrup. Oh so divine! I made these as muffins this morning and they were wonderful. I thought the glaze was a bit too sweet, so I would recommend a very thin layer. They are great without the glaze also.